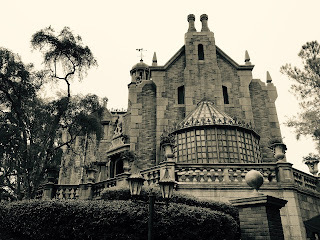 Haunted Mansion is my favorite Disney attraction for many reasons. I'm always looking to get interesting pics of this iconic ride. However, it is tough to get clear shots in the dark, so most of my photos are of the exterior of the building. Today, I took this picture during a thunderstorm and added a black and white filter. 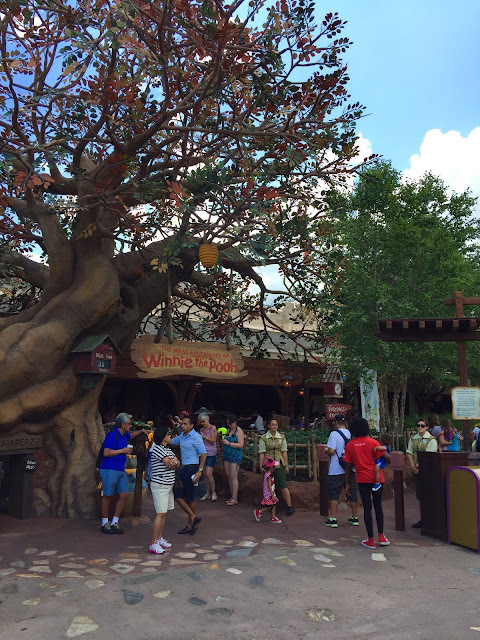 Animal Kingdom is a park that continues to expand. Just a few weeks ago, Zuri's Sweets Shop opened near the new Harambe Market in the Africa section of the park. This spot serves very interesting animal themed treats. I took this shot yesterday while checking out the new shop. The Magic Kingdom Car Barn is located in the northwest corner of Town Square, next to the Harmony Barber Shop. 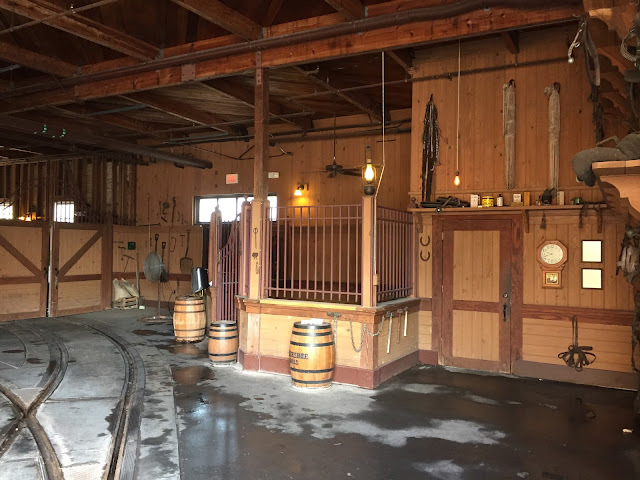 This is where they keep the horse drawn trolley car when it's not being used . Also, the horses are kept in this area as well. At the end of the day, they take the horses back to Fort Wilderness where they live. I took this shot this morning, just prior to getting a hair cut. In the old days, characters at Walt Disney World would roam the streets, and guests would approach them for pics and autographs. Now, most characters have their own spots in the parks where visitors can line up in an orderly fashion to meet their favorites. 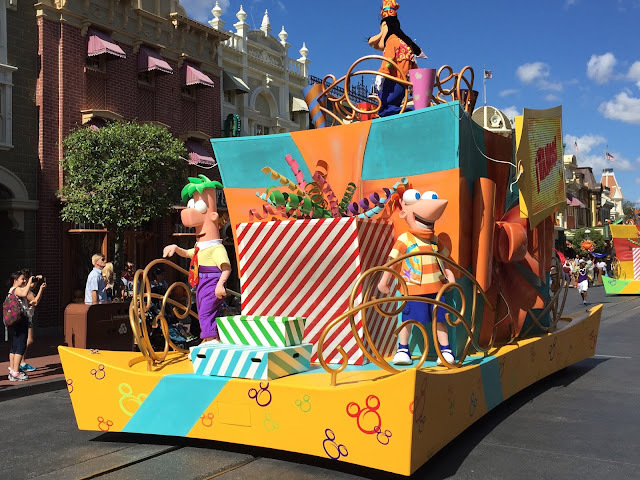 However, in Town Square, you sometimes see them heading from their "station" to the backstage area. 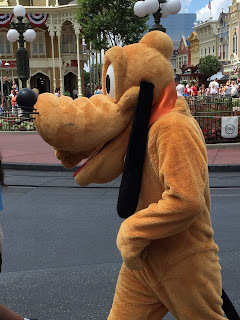 This was the case last weekend when I snapped this pic of Pluto. 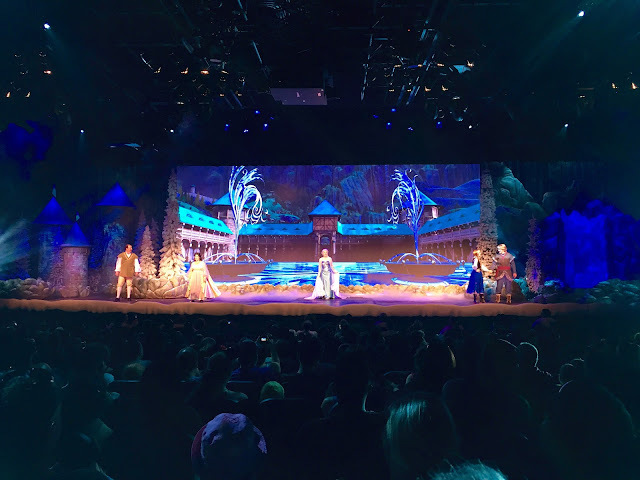 Recently, the Frozen Sing-Along Celebration moved to a more permanent home in the old American Idol theater at Hollywood Studios. This new location is bigger, with a huge screen, better sound, and even more indoor snow. I took this shot last weekend while checking out the new version for the first time. This is a side view of Gaston's Tavern in the Magic Kingdom. I took it last week from the area where Gaston himself greets guests each day. Although it has the "tavern" designation, there is no alcohol served there. However, you can enjoy a delicious LeFou's brew, which is a frozen, apple flavored drink with a passion fruit-mango foam topping. 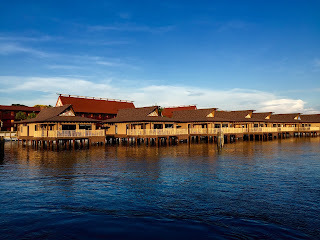 The new bungalows recently opened at the Polynesian Village Resort. These DVC villas all have great views of Cinderella Castle and their own "plunge" pools. Starting at over $2,000 a night, they are some expensive accommodations. 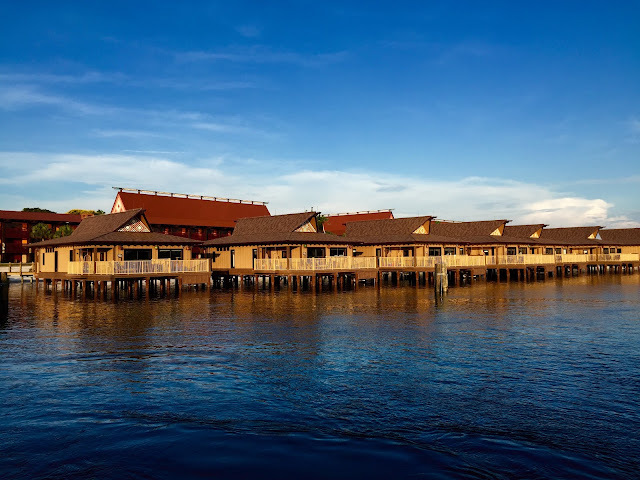 However, these exclusive "rooms" can sleep up to 8 guests. I took this shot from the Magic Kingdom ferry boat yesterday morning. Today is the 60th anniversary of the debut of Lady and the Tramp. 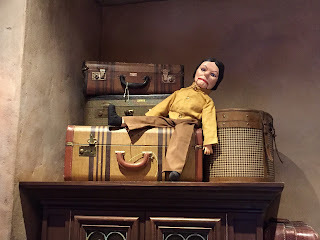 Tony's Town Square restaurant in the Magic Kingdom is themed to this film. 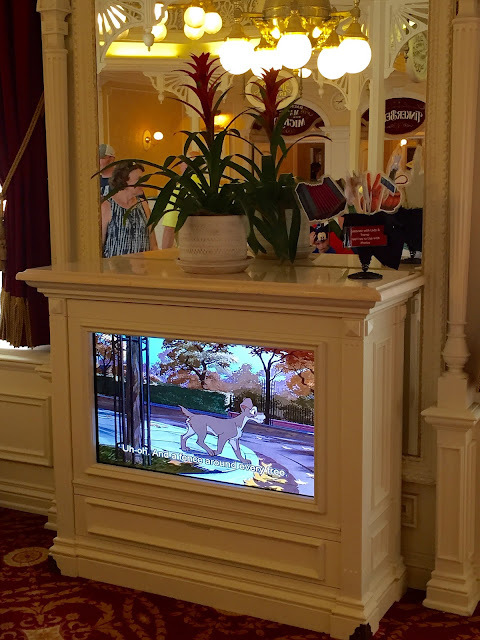 While guests are waiting for a table, they are able to enjoy the movie on a tv in the lobby. I took this shot today while my tour guests were meeting Mickey Mouse next door. One of the best counter service restaurants in Walt Disney World is Sunshine Seasons at Epcot. 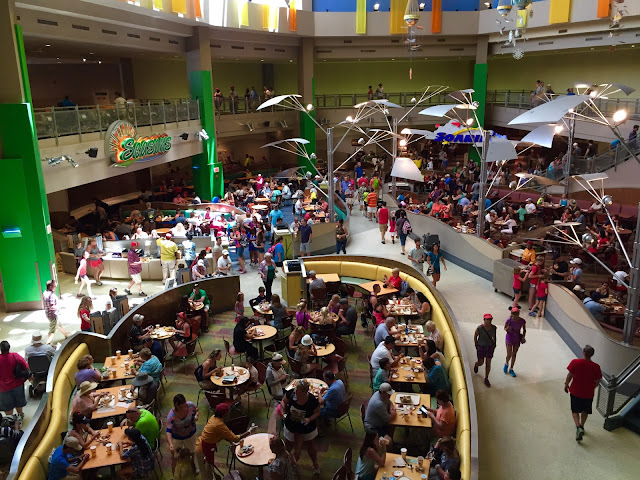 Located in The Land pavilion, it features several serving stations and plenty of seating. There are four "season" sections which match the hot air balloons hanging overhead. This place also serves one of my favorite desserts.....the key lime tart. 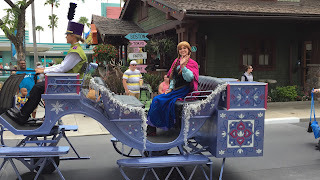 Disney has brought back their Frozen Summer Fun event to Hollywood Studios this year. From now until mid September, guests can enjoy extra Frozen entertainment, including a parade, dance party, and fireworks. This shot of Anna is from today's parade. Although the Swan and Dolphin aren't official Disney resorts, they are some of the most unique architectural structures on property. We were leaving the back exit of Epcot last week when I took this shot. 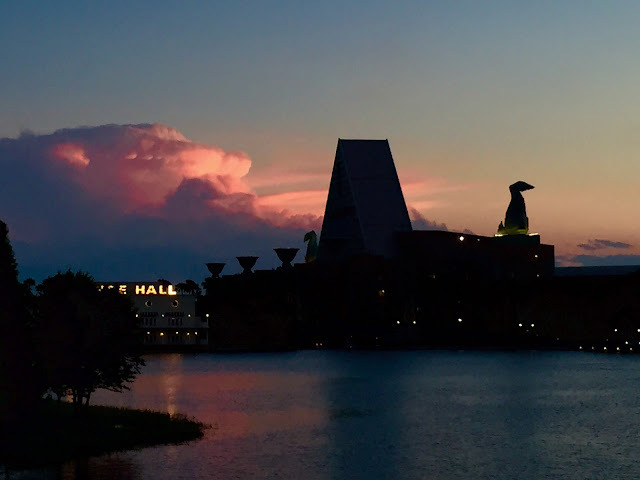 This sunset photo of the Dolphin is helped by the storm clouds in the distance. 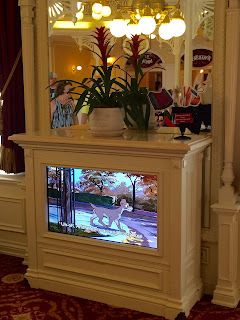 The Carousel of Progress is a special attraction for several reasons. 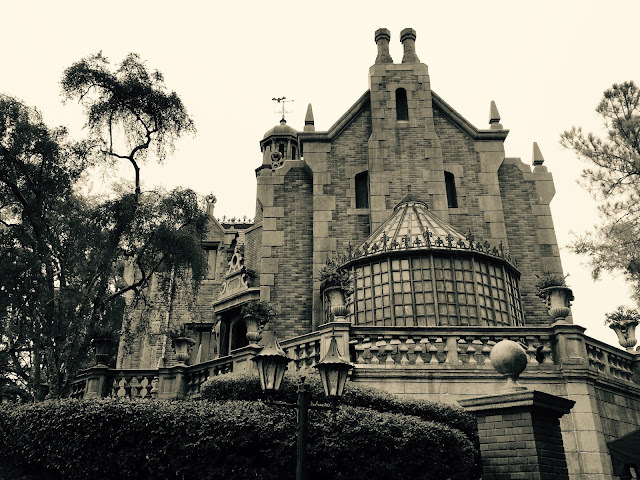 It is one of the oldest in the Magic Kingdom, and Walt Disney himself worked on it. Last week, I found myself standing next to the control panel out front near the loading area. It contains a large bank of video screens, as well as buttons and levers that appear to be decades old. It seems they try to keep this attraction as original as possible for nostalgic purposes. This is the first animal to greet you when entering the Maharajah Jungle Trek at Animal Kingdom. 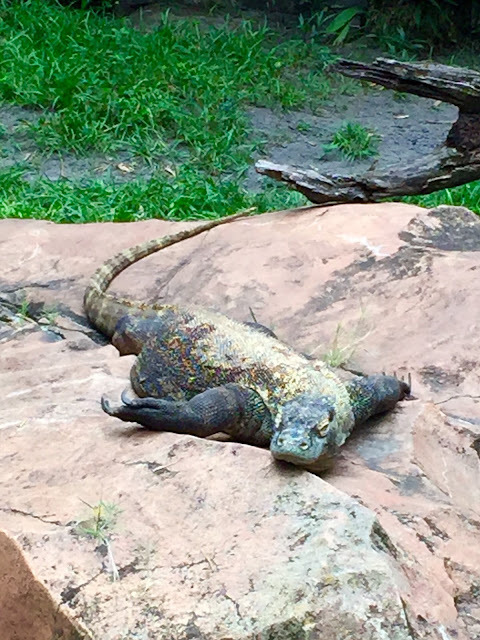 The Komodo dragon is a large, dangerous lizard, capable of moving up to 12 miles per hour. Although you can get pretty close to this guy for a picture, there is a nice sized ditch between us that keeps him at a safe distance. The quality of photos taken on The Great Movie Ride often depends on where you are sitting in the ride vehicle. Whenever I'm on the end of a row, I try to get some good shots. This was the case the last time I visited the attraction. I was able to get a nice shot of Ingrid Bergman and Humphrey Bogart in this classic scene from Casablanca. I took this shot while waiting for my tour guests at the Jungle Cruise last week. I think it sums up the Adventureland theme. 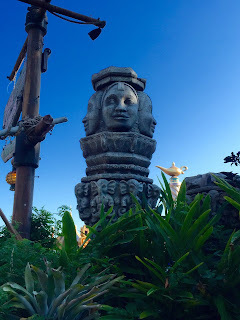 You have the jungle foliage, the tiki statue, and you can even see the genie's lamp atop The Magic Carpets. 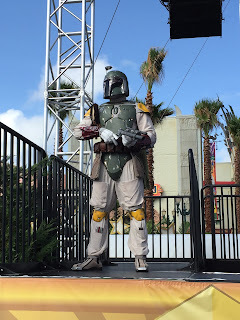 Today was the last day of Star Wars Weekends for 2015. Hollywood Studios was packed and guests started lining up for the parade right at park opening. I took this shot of Boba Fett as he was "guarding" the stage this morning. Today is a significant day in the Toy Story franchise for two reasons. Tim Allen, the voice of Buzz Lightyear, is celebrating his 62nd birthday today. Also, today is the fifth anniversary of the premier of Toy Story 3, which opened on June 13, 2010. 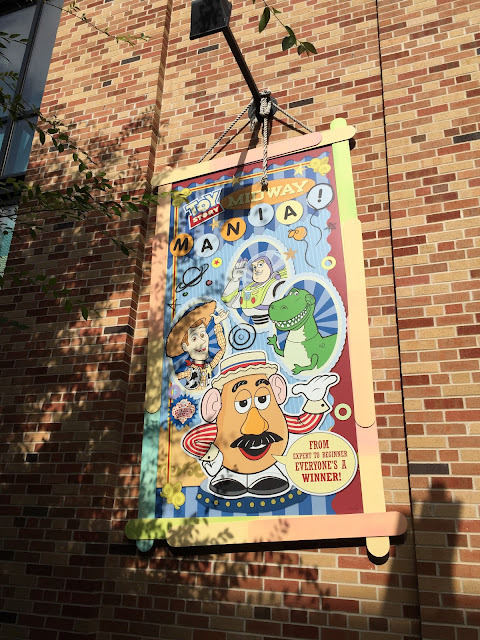 To commemorate both of these events, I took this shot of Toy Story Mania at Hollywood Studios. Since the Phineas and Ferb show aired its final new episode thonight, I thought it would be fun to post a picture of the famous brothers. This shot was from the street party that entertains guests at the Magic Kingdom everyday. Although the show is off the air, I'm sure that these characters will remain at Walt Disney World for years to come. Tower of Terror is one of the best themed attractions in all of Walt Disney World. From beginning to end, you feel like you've been transported back to a deserted hotel in 1939. 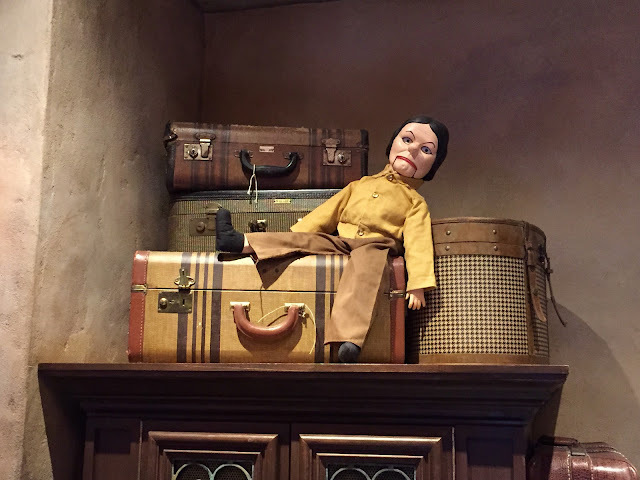 When walking out of the attraction exit a few days ago, I noticed this creepy looking doll on a shelf behind the ride photo counter. The custodial cast members do an incredible job keeping Walt Disney World clean. However, some of them have addition skills as well. 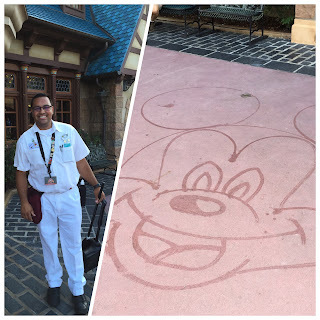 Today, I watched Francisco create some famous Disney characters with just water and a broom. He "painted" this giant Mickey head near the Pinocchio Village Haus in Fantasyland. Today, we say happy 81st birthday to Donald Duck. He made his first film appearance on June 9, 1934 in The Wise Little Hen, which was a Walt Disney "Silly Symphony" short. 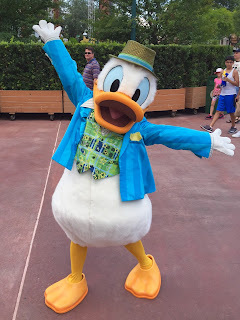 I took this shot of Donald at Hollywood Studios. He looks pretty good for 81! The Beach Club is one of my favorite Disney Resorts. It's in a great location and it has an amazing pool. 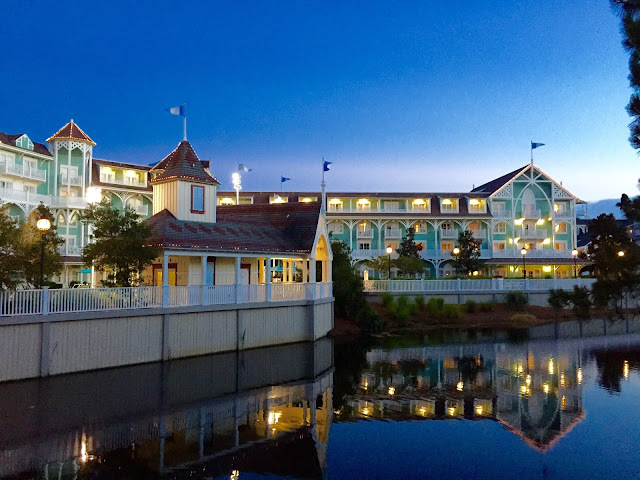 I took this shot of the Villas at sunset, just after leaving Epcot last night. Tonight, we were at Epcot to enjoy the first night of the "Sounds Like Summer" concert series. As we were leaving the American Gardens Theater, we headed toward Japan. 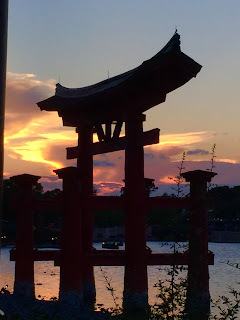 I took this shot of the pretty Florida sunset through the torii gate. 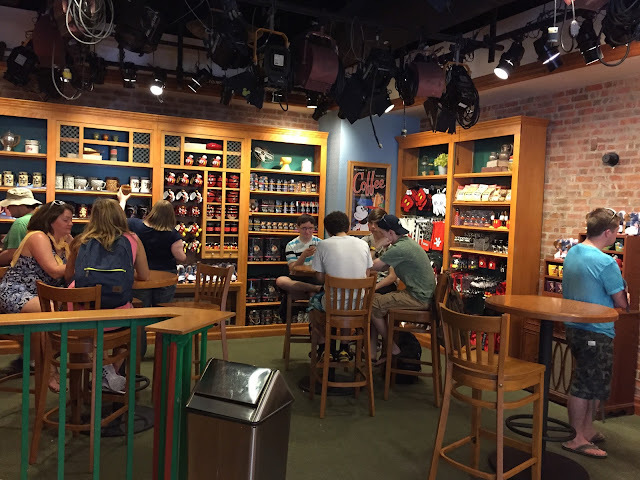 The Writer's Stop is a great place for a quick break at Hollywood Studios. You can grab a cup of coffee and a snack while escaping the Florida heat. 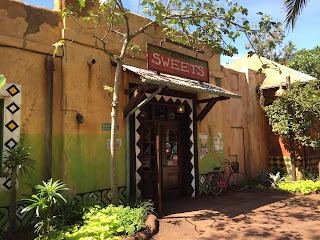 There are tables and chairs, books to browse or buy, and one of the best treats in all of Walt Disney World.....the carrot cake cookie. Sixteen years ago today, the first guests visited The Many Adventures of Winnie the Pooh at the Magic Kingdom. Originally, this spot was home to Mr. Toad's Wild Ride, but Pooh took over in 1999. Winnie the Pooh is the 2nd highest grossing Disney character, so building a ride with a gift shop made sense. 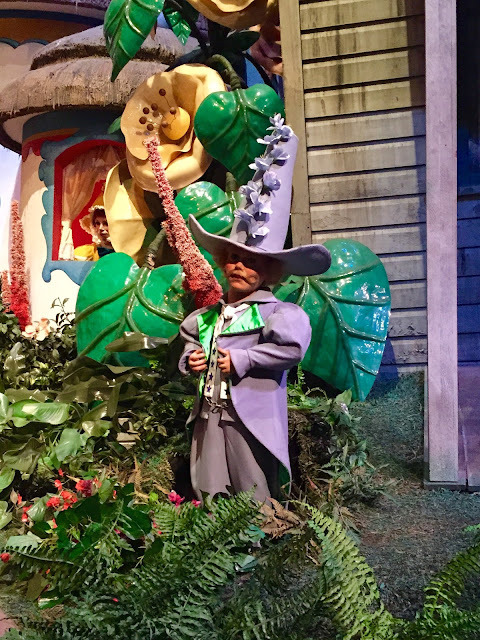 Those of us who were fans of Mr. Toad can still see his attraction out in Disneyland. 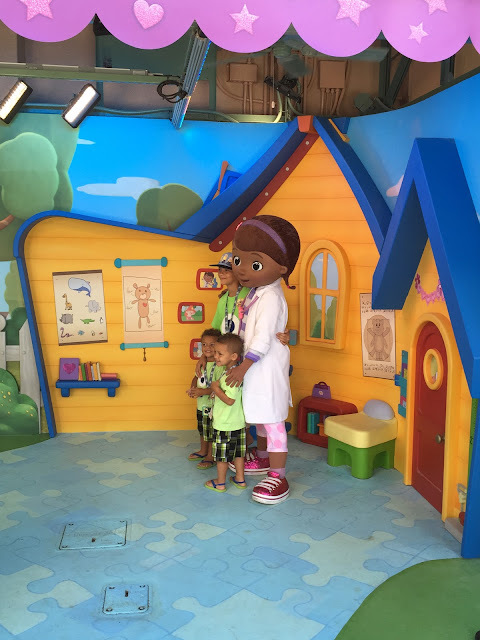 Doc McStuffins is a very popular Disney Jr. star who guests could only meet while dining at Hollywood and Vine. However, Doc recently got her own "meet and greet" location in the Animation Courtyard area of Hollywood Studios. 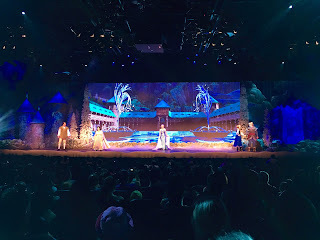 She joins Sofia and Jake just outside of the Disney Jr. Live on Stage show. Now, all guests can meet her without needing a dining reservation. 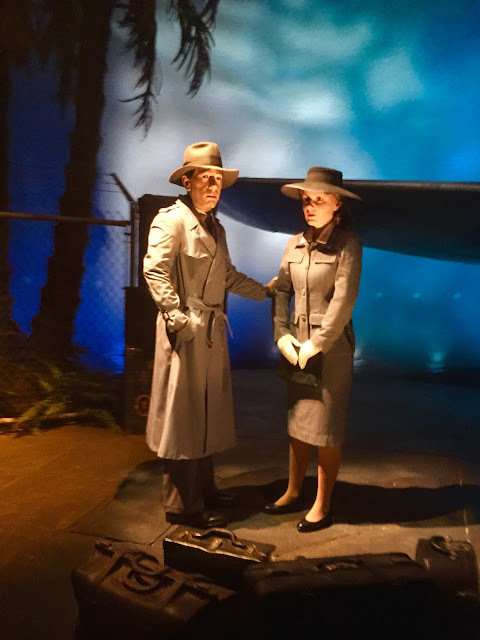 Recently, The Great Movie Ride became sponsored by the Turner Movie Classics network. Today, I had the chance to see some of the updates. The ride is essentially the same, however there is a new preshow movie and an updated ending montage. 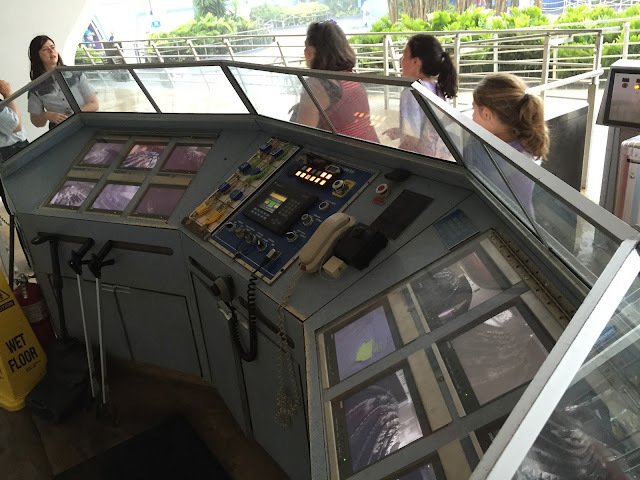 They have also added some recorded narration in the ride vehicles. 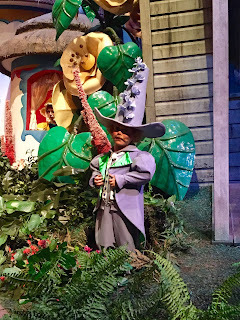 As I was riding today, I shot this close-up of one of the munchkins in the Wizard of Oz scene. Here is a shot that falls under the "don't see this everyday" category. I was in the Transportation and Ticket Center monorail station yesterday when I saw something interesting. 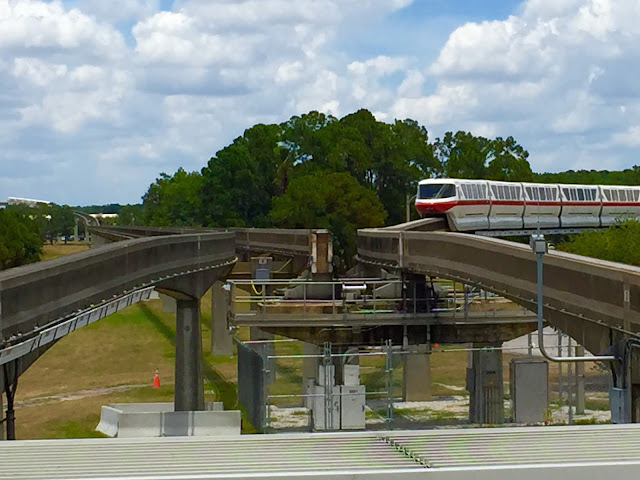 They were in the process of switching monorail red from the Magic Kingdom express line to the Epcot line. If you look closely you will see the exposed "switch beam" in the middle of the photo, as the monorail was in the process of entering the Epcot line. A few moments later, the beam slid over and reconnected with the express line, and service to the Magic Kingdom was resumed. Today we say happy 5th birthday to the Magic Kingdom's carrousel......sort of. This attraction has actually been in the center of Fantasyland since opening day in 1971. 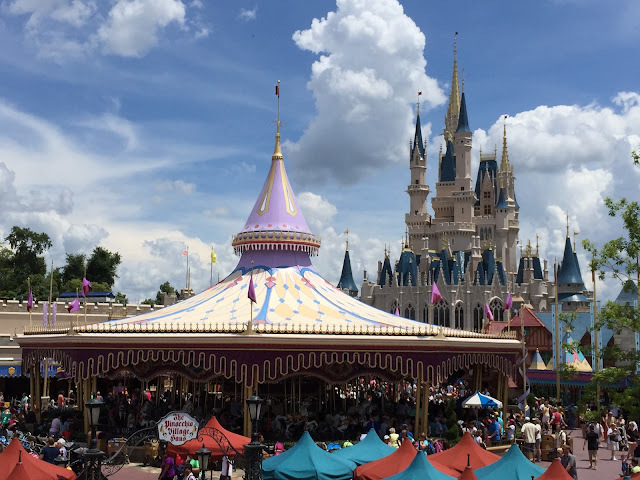 However, for its first 39 years it was called Cinderella's Golden Carrousel. On June 1st of 2010, it became Prince Charming Regal Carrousel. 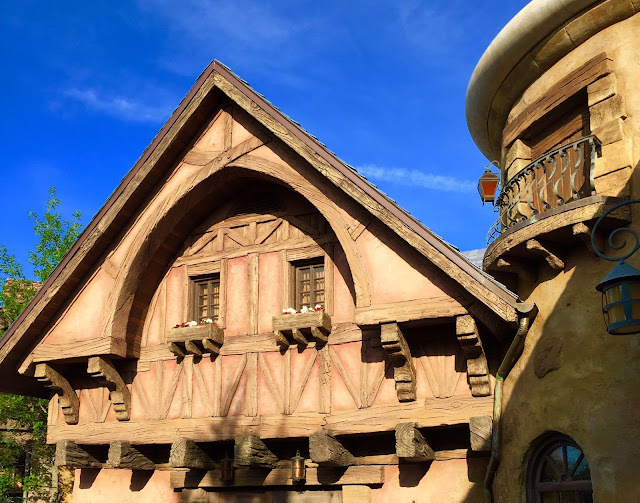 I took this shot today from the outdoor balcony of the Pinocchio Village Haus restaurant.